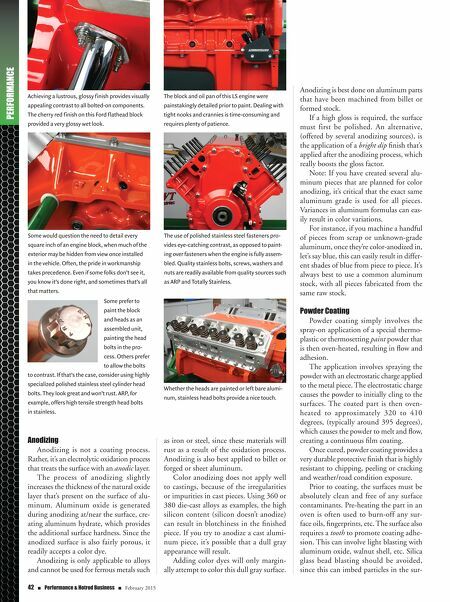 42 n Performance & Hotrod Business n February 2015 PERFORMANCE Anodizing Anodizing is not a coating process. Rather, it's an electrolytic oxidation process that treats the surface with an anodic layer. The process of anodizing slightly increases the thickness of the natural oxide layer that's present on the surface of alu- minum. Aluminum oxide is generated during anodizing at/near the surface, cre- ating aluminum hydrate, which provides the additional surface hardness. Since the anodized surface is also fairly porous, it readily accepts a color dye. Anodizing is only applicable to alloys and cannot be used for ferrous metals such as iron or steel, since these materials will rust as a result of the oxidation process. Anodizing is also best applied to billet or forged or sheet aluminum. Color anodizing does not apply well to castings, because of the irregularities or impurities in cast pieces. Using 360 or 380 die-cast alloys as examples, the high silicon content (silicon doesn't anodize) can result in blotchiness in the finished piece. If you try to anodize a cast alumi- num piece, it's possible that a dull gray appearance will result. Adding color dyes will only margin- ally attempt to color this dull gray surface. Anodizing is best done on aluminum parts that have been machined from billet or formed stock. If a high gloss is required, the surface must first be polished. An alternative, (offered by several anodizing sources), is the application of a bright dip finish that's applied after the anodizing process, which really boosts the gloss factor. Note: If you have created several alu- minum pieces that are planned for color anodizing, it's critical that the exact same aluminum grade is used for all pieces. Variances in aluminum formulas can eas- ily result in color variations. For instance, if you machine a handful of pieces from scrap or unknown-grade aluminum, once they're color-anodized in, let's say blue, this can easily result in differ- ent shades of blue from piece to piece. It's always best to use a common aluminum stock, with all pieces fabricated from the same raw stock. Powder Coating Powder coating simply involves the spray-on application of a special thermo- plastic or thermosetting paint powder that is then oven-heated, resulting in flow and adhesion. The application involves spraying the powder with an electrostatic charge applied to the metal piece. The electrostatic charge causes the powder to initially cling to the surfaces. The coated part is then oven- heated to approximately 320 to 410 degrees, (typically around 395 degrees), which causes the powder to melt and flow, creating a continuous film coating. Once cured, powder coating provides a very durable protective finish that is highly resistant to chipping, peeling or cracking and weather/road condition exposure. Prior to coating, the surfaces must be absolutely clean and free of any surface contaminants. Pre-heating the part in an oven is often used to burn-off any sur- face oils, fingerprints, etc. The surface also requires a tooth to promote coating adhe- sion. This can involve light blasting with aluminum oxide, walnut shell, etc. Silica glass bead blasting should be avoided, since this can imbed particles in the sur- Achieving a lustrous, glossy finish provides visually appealing contrast to all bolted-on components. The cherry red finish on this Ford flathead block provided a very glossy wet look. The block and oil pan of this LS engine were painstakingly detailed prior to paint. Dealing with tight nooks and crannies is time-consuming and requires plenty of patience. Some would question the need to detail every square inch of an engine block, when much of the exterior may be hidden from view once installed in the vehicle. Often, the pride in workmanship takes precedence. Even if some folks don't see it, you know it's done right, and sometimes that's all that matters. 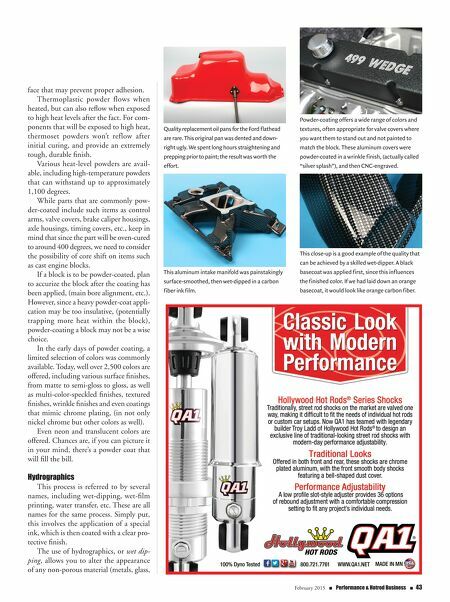 The use of polished stainless steel fasteners pro- vides eye-catching contrast, as opposed to paint- ing over fasteners when the engine is fully assem- bled. Quality stainless bolts, screws, washers and nuts are readily available from quality sources such as ARP and Totally Stainless. Some prefer to paint the block and heads as an assembled unit, painting the head bolts in the pro- cess. Others prefer to allow the bolts to contrast. If that's the case, consider using highly specialized polished stainless steel cylinder head bolts. They look great and won't rust. ARP, for example, offers high tensile strength head bolts in stainless. Whether the heads are painted or left bare alumi- num, stainless head bolts provide a nice touch.